This Easter Egg Wreath is a great gift idea for someone special at Easter time. This is a great group craft that a few children can make for Grandparents, teachers, or babysitters - each child can decorate a few eggs. Suitable for preschoolers on up! • Piece of cardboard cut into a doughnut shape (you can also look at your local craft store for a wreath base made of sturdy cardboard or thin plywood). 1. Glue Easter grass all around your wreath base. 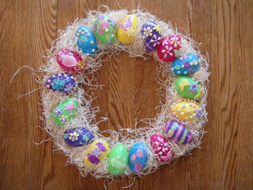 Split your eggs in half and place them around the wreath so you will know how many you will need to decorate. Split the eggs evenly among a group of children to create! 2. Decorate the half eggs with fancy embellishments (fancy doesn't have to mean expensive). We put different colors of loose glitter in paper plates and had the children make designs with white glue and then roll the egg in the glitter. We also you self-adhesive shapes which made it easy and fun to decorate! Be creative! 3. Once all the eggs have been decorated and dried, glue the eggs to the wreath. You can use regular school glue, but to make it extra sturdy you (an adult) can use hot glue!